Just wondering if anyone else has experienced a stress crack on their rig? I have a stress crack going down from the left bottom corner of the driver' side bedroom slide. It's grown to about 4". I am having it repaired under Tiffin's warranty, although I was told it would come-back and eventually go all the way down the side. Tiffin's long-term solution is to place a rubber strip, which they did supply, over the repair that will hide the crack when it returns. According to the repair shop these cracks are common and can not be fully repaired. Is anyone else experiencing sidewall fiberglass cracking? You may need to create a signon there to read the comments. Thank you OKGC-just the info I needed, also great forum to be involved with. When we got the Allure, it had a crack in the sidewall extending from the corner of the slide opening down to the belt line. It was not straight....it traveled at a bit of an angle. I called Country Coach and they said they had some issues in that model with this and suggested I could get it repaired. I had a friend who does auto and RV collision repair look at it and he said that while he could re-glass the crack, repaint and have it looking new again, he could not guarantee it would not come back. His thinking (and mine) was that it was due to some stress/flexing and it just would crack again. So, rather than spend $$$ on a repair that might not last, I covered the crack with a piece of 2" Eternabond tape to make it waterproof, then covered it with the chrome louver you see in the pic. 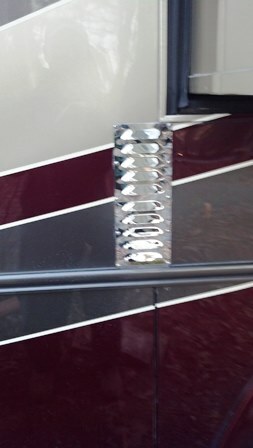 It is actually two chrome louvers I got from West Marine. No one has ever mentioned it and it just looks like some sort of vent. Well that was a good idea! Actually looks nice without spending a fortune. Good job! I had a crack in my 2013 Zephyr below my DS slide out at the corner. Called Tiffin service had repaired under warranty with a filler piece of molding. I thought it would look unsightly but frankly I don't even notice it. The colors all match perfectly and no issues. I don't think it should have happened in the first place but alas it did and was remedied and no further cracks have appeared or reappeared.